Jazz pianist and popular singer Nathaniel Adams Coles was born into a musical family in Montgomery, Alabama on March 17, 1919. His mother Perlina was a choir director in his father Edward’s Baptist church. His three brothers, Edward, Ike, and Freddy, became professional musicians. Cole also had a half-sister, Joyce. The family moved to Chicago, Illinois in 1923 where Cole started playing the piano at age four; he organized his first jazz group, The Musical Dukes, in his teens. Despite his success, Cole faced racism in and outside the South. In 1950, after his family purchased a house in the formerly all-white neighborhood of Hancock Park in Los Angeles, the Ku Klux Klan burned a cross on his lawn. He was the victim of a vicious racist attack perpetrated by six white men in his native state of Alabama in 1956. He performed in Cuba that same year and was not allowed to stay at the Hotel Nacional de Cuba because of racism. He returned to Cuba a year later, sang songs in Spanish, and there is now a bust of him and a jukebox in tribute at the Hotel Nacional. In 1957 he became the first African American entertainer to have his own television show. It lasted less than a season because bigotry kept needed sponsors away. Cole’s actions were often controversial within the African American community. Claiming that he had never taken part in civil rights protests, he expressed surprise when he was attacked by white supremacists in Birmingham in 1956. At the same time, however, he contributed to civil rights causes such as the Montgomery Bus Boycott, and he filed lawsuits against northern hotels that refused him service. Still, Cole’s performances for “Jim Crow” audiences disturbed black activists. Thurgood Marshall, then chief legal counsel to the National Association for the Advancement of Colored People (NAACP), reportedly labelled Cole an “Uncle Tom.” The Amsterdam News saw Cole as an “insult to his race.” Such accusations were obvious overstatements, but—recognizing their concerns—Cole finally joined other entertainers in refusing to perform before segregated audiences. 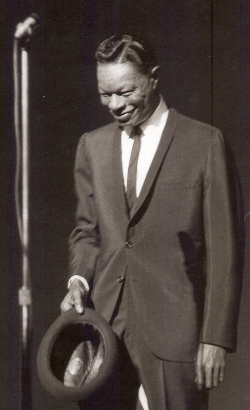 In 1956 he performed at the Republican National Convention, and in 1960 at the Democratic National Convention. Nat King Cole appeared in popular films as well, among them China Gate (1957) and Cat Ballou (1965). He received numerous awards and traveled internationally. An avid smoker of Kool cigarettes, he died of lung cancer in Santa Monica, California on February 15, 1965. He was 45. Eileen Southern, Biographical Dictionary of Afro American and African Musicians (Connecticut: Greenwood Press, 1982); Nicolas Slonimsky, Bokers Biographical Dictionary of Musicians (London: Schirmer Books, 1984); Jim Irwin and Colin McLear, The Mojo Collection (NY: Cananongate, 2000).